the interior renovation of this ‘cranky’ one bedroom krantz and sheldon apartment in "causeway gardens" demonstrates that a small space can be plentiful and provide delight within a 45sqm envelope. it is a design exercise in ‘quality over quantity’, of refurbishing rather than building anew. it houses an elderly woman downsizing from a 4 bedroom, 2 bathroom house with a swimming pool to a one bedroom inner city flat and seeks to engage in a conversation about ways of ageing gracefully in place. a single piece of cabinetry is used to spatially unify the project, providing continuity between the four primary spaces and as a way of tying together the complex geometry. 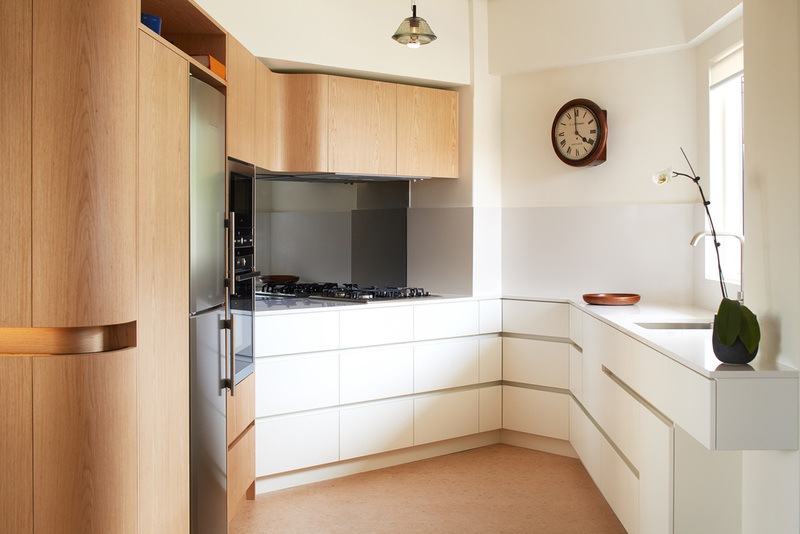 the cabinetry is the main cost component of the project and houses the essentials for living. it is something that was not specifically called for in the brief but manifest as the accordant and discordant object within the original architecture. 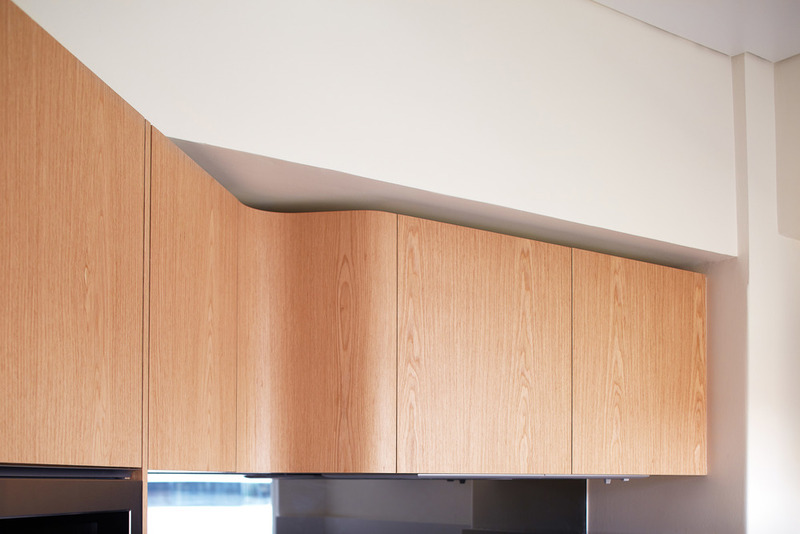 the cabinetwork also responds at a more intimate scale to our client with the provision of a handrail, continuous light source and curved surfaces so that the apartment can be comfortably navigated along it’s shortest possible route. the materiality of this piece is used to separate and differentiate it from solid load bearing structure and shell of the apartment and grounds itself on a similar tone of floor. all other ‘cranky’ surfaces and in particular the outer shell are left intact and simply painted. the client’s treasures were listed, drawn and curated and further furniture pieces sourced and restored to purposely fit this small space. other elements such as the softness of cork flooring and shower bench with hand shower, and widths of openings were design considerations that will allow the client to inhabit the space for many years to come.